Now that we are down to 2 weeks until Christmas, I'm turning the holiday vibes up a notch up with a classic holiday Look and a giveaway (at the end of this post) in collaboration with JCPenney! I feel like I checked off the festive requirements with this outfit that I chose from Liz Claiborne (exclusively sold at JCPenney): pops of red- check! metallic dress- check! gold glitter- ding ding ding! JCPenney has a variety of on-trend, high quality pieces, that are affordable (which is music to my ears during this shopping season)! For this look I went with a classic fit and flare silhouette in this gorgeous cream and metallic fabric (Liz Claiborne also offers this silhouette in black and other prints)! I jazzed up the look with pops of red and some sparkle with this Liz Claiborne® Phone Charging Wallet... yes you heard that right, it charges your phone while in your purse! It's such a fashionable and functional piece that can keep your phone alive while you're out at the Holiday party or also serves a good gift this season! In the spirit of JCPenney's #JoyWorthGiving, I'm giving a new Liz Claiborne® Phone Charging Wallet away to one of you! See how you can enter at the end of this post. If you still are not done with your shopping list, stop by JCPenney that not only has gorgeous fashion like what I'm wearing today, but also items for kids, men, home, beauty, etc at good prices which will definitely be #JoyWorthGiving! Prize: A brand new Liz Claiborne® Phone Charging Wallet (valued at $50) Use the Rafflecopter below to enter where the more ways you follow, the better chance you have of winning this prize! This Giveaway will run until 11:59pm PST December 18, 2016 and is open to U.S. residents only. The winner will be chosen at random using Rafflecopter's random.org, verified, and contacted via email! Winner will have 24 hours from the email to claim prize, if not a new winner will be chosen. 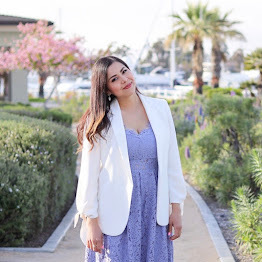 Thank you to JC Penney for collaborating with me on this post! I love that dress, you look sooooo amazing and your photos are so beautiful!